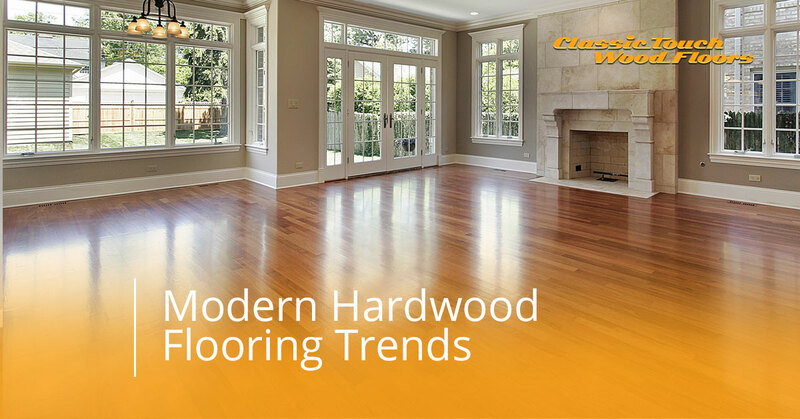 Modern Hardwood Flooring Trends | Get Your Custom Hardwood Floor From Us! Classic Touch Wood Floors is proud to be the hardwood floor contractors of choice for many people throughout Central Pennsylvania. We are locally owned and operated in Shamokin, but our service area is much more expansive than just Shamokin’s immediate area. We have a passion for delivering quality custom hardwood floors for the people of Central Pennsylvania. Cities within our hardwood flooring company’s service area include some of the following. Wherever you are in that area, we want to take the time to inform our readers about some of the more modern trends we are seeing within the world of hardwood floors. So keep reading if you are looking for some inspiration to help you in your hardwood flooring selection journey! It’s a fun one if you let it be, so why don’t you get yourself a cup of coffee and imagine what your home might look like with some of these incredible wood floor styles. It’s pretty remarkable to think that we are almost in 2018. Each year seems to fly by more quickly than the last! But even as the days, months, and years feel like they accelerate incessantly, there are some things that stand the test of time categorically. Hardwood flooring is certainly one of these things. Just think about it. Older, quaint homes, rustic log cabins, high-end mansions, and even modest homes from any era can all be aesthetically improved with the addition of a hardwood floor. Let’s take a look at some of the trends we’ve noticed the industry moving toward. While we are certainly experts in the world of hardwood floor installation and repair, we won’t pretend to be bastions of contemporary style when it comes to the constantly-changing world of interior design. That’s why we combine our sliver of the experiential pie within the industry with what an expert, Cindy Weinstock from The Flooring Lady, is saying about 2017 and 2018 trends. Cindy’s theory has been proven to hold water. People are interested in less-traditional, neutral styles of hardwood in favor of lighter wood flooring options, and even softer woods like cork and pine, as Cindy mentioned. With the trend of more bold looks and feels throughout the house, it makes sense that people in need of a custom hardwood floor installation are choosing hardwood floor styles that complement a bold paint or even a wallpaper. Blonde wood flooring is gaining traction. People are opting for a lighter approach because it gives most rooms a more polished and roomy look. On top of that, it makes any room brighter, and open to receiving light. We recommend blonde wood flooring if your selected paint color is white, or close to it. Not every room needs blonde wood flooring. It’s certainly a unique look that accomplishes a focused ambiance. Grey tone wood floors, on the other hand, are a much more versatile option than many others. Not only does it complement a variety of rooms with an array of different decorative feels, but it gives any room a lovely neutral foundation to build off of. You can make it professional, especially when you opt for a wide plank wood floor. Although dark hardwood flooring is without a doubt more difficult to maintain than the previously described options, going with a dark finish, perhaps a rich walnut, gives most any room a wonderful combination of class and coziness. We love installing dark hardwood floors on rooms with fireplaces, too, for exactly that reason. But fair warning, dark hardwood floors reveal dirt, dust, and pet hair much more easily than other flooring options. If you are committed to its upkeep, however, we think an option like walnut or red oak is tough to beat if it fits the room you are thinking of. Now that we’ve touched on the grey vs. light vs. dark discussion, let’s move onto some 2017 and 2018 pattern trends. Your floor’s layout can make a huge difference, which is something that many people in need of a new hardwood floor fail to consider during the purchasing process. Rest assured, however, that we here at Classic Touch Wood Floors walk through the entire process with you. We will be discussing a variety of options, among them being layout patterns, wood floor finishes, textures, and more. Diagonal Wood Floors – As opposed to laying your hardwood floor in a straight direction, some homeowners are electing for a bit of a twist, diagonally angled wood floors. Going this route immediately makes whichever room it’s applied to appear more unique and eye-catching. The drawback of this custom wood flooring style is that it takes more materials and will likely cost a bit more for installation. But the massive positive is that it gives your room a look that’s all its own! Mixed-Width Wood Floors – While we are discussing unique flooring styles, mixed-width wood floors are a recent trend that also sets your home apart from the mundane. We don’t think mixed-width floors will ever become any sort of staple in the field, so that might provide you with more or less motivation to have it done on your home. If you do choose to go in this direction, you are sure to get myriad compliments about it from guests. We say, go for it! Wider Planks – Having been on the rise for a few years now, it’s easy to understand the appeal of wide planks when you see it in person. They make any room they are applied to appear much larger. While homes built from the 50s until the turn of the century typically used 2 ¼” strips, homeowners and hardwood flooring contractors are going with strips that are 3 ¼” or wider. We love this option if you are looking to subtly add an aura of spaciousness to any room, but it also looks great if you have a rustic theme to your abode. Now that we’ve addressed some of the more modern concepts people are choosing in the world of hardwood floors, you are going to need to know who the hardwood flooring experts are in Central Pennsylvania. Classic Touch Wood Floors can help you turn your new house into your dream home. Your Bloomsburg flooring contractor, Classic Touch Wood Floors, has the experience, pricing, passion, and skill to help you find a custom hardwood floor that fits your style. People come to us for our free estimates, our friendly and knowledgeable staff, and unparalleled expertise. Reach out to us for special first time offers no matter where you are in Central Pennsylvania. We would love to help you find an affordable hardwood flooring solution you are proud of!